Below you will find information and examples of our Autostar Certified Preowned Program checklist and inspection. You can check out all our Autostar Certified Preowned vehicles on our main website. Just what is the new Autostar Certified Preowned Program Checklist? I’m glad you asked. We’ve recently put together a process for a 100 Point in-depth used car certification process. 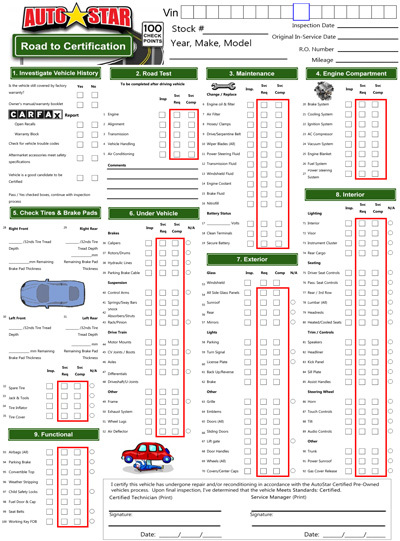 This Autostar Certified Preowned Program Checklist is currently rolling out at all of our Autostar stores. We’ve done this to make sure that when you purchase your vehicle from one of our Autostar locations you can be confident you’re purchasing a quality pre-owned vehicle. We understand that you work hard for your money and the last thing you want to do is repair the vehicle you just purchased. Every day we hear horror stories from people just like you about their previous experiences. We don’t think it’s right for you to purchase the used vehicle you’ve had your eye on only to have it break down on you on your way home. In fact we’re so confident in our certification process that every vehicle inspected and marked as an “Autostar Certified Pre-Owned” will include a 3 month/3,000 mile limited powertrain warranty at no cost to you. I know the above picture might be a little small so I’ll break down a few of the major headings and a couple of examples of what we inspect under each below. Each inspection checklist is known as the “Road to Certification”. It is dated and signed by both the Certified Technician performing the inspection as well as the Service Manager at the shop. Stay safe and protect your investment. When you purchase a used vehicle ask to see the inspection checklist. Or you can save yourself the hassle and purchase at your local Autostar location where we’ll give you a copy of the Autostar Certified Preowned Program Checklist on request. Don’t just buy a vehicle, purchase with confidence with Autostar USA. Jason has been an active member of AutostarUSA and it's affiliates since the very beginning. He started in the company as a Sales Person and served in several positions on his way to Digital Marketing Director for the company and Automotive Digital Informant on our blog site. Since he started in the automotive industry in January of 2011 he has been a sales person, internet sales consultant, internet coordinator, lost opportunity coordinator, IT manager, Customer Relations Manager, Internet Director and currently serves as the Digital Marketing Director within Autostar USA and it's affiliates including Autostar Family Dealerships, Waynesville Automotive Group and Hendersonville Automotive Group.